Today I’m sharing simple Popsicle stick ornaments for kids to make this Christmas, and a story to go with them. You can make the ornaments without the story, or read the story without the ornaments – but they’re fun to do together. 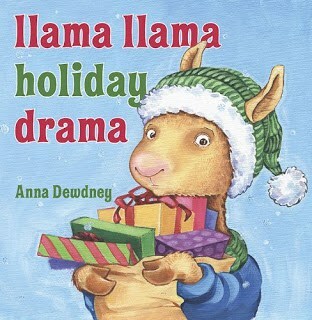 The story is Llama Llama Holiday Drama by Anna Dewdney (affiliate). 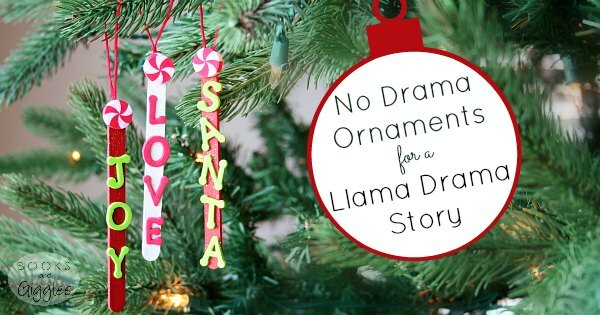 It’s about a Mama llama (yes, a llama! There’s a whole series of these wonderful books) who is getting ready for Christmas, and her sweet little llama child who is getting impatient. I think we can all relate! Dewdney’s charming illustrations show Mama Llama shopping, baking, crafting and decorating. The rhyming text explains how little llama hates to wait. Will Christmas day ever come? Finally, he can’t take it anymore, and has a tantrum. Mama llama handles it gracefully. She sits him on her lap, hugs him, and reminds him that the important thing is spending time together. The story gives you a good opening for talking with your child about what Christmas means to you. You can discuss words like joy, love, and peace. 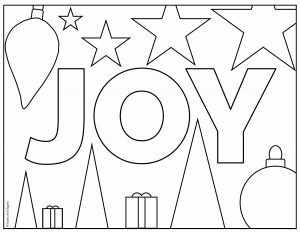 To extend that further, you can make Christmas ornaments. I went with Joy, Love, and Santa. Two grownup words, and one kid word. You might as well acknowledge what’s most important to your child while introducing the larger concepts. Write out the words you choose and talk about their letter sounds at whatever level your child is at. Your child can help pick out the letter stickers you’ll need. 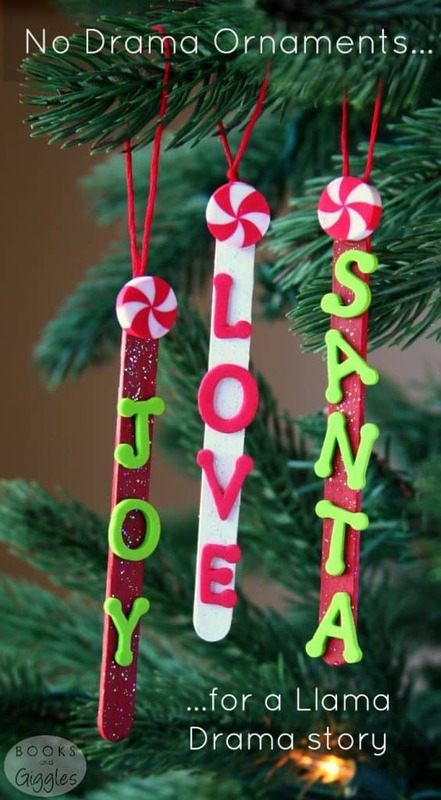 Making these little Popsicle stick ornaments is really simple. No drama. There is a bit of waiting for paint and glue to dry. Might as well practice waiting, right? 1. Paint the craft sticks and let dry. 2. Paint the sticks again with sparkle glaze or glitter glue. Let dry. 3. Glue or stick on embellishment at the top. The ones shown are mini erasers from the same pack I used to decorate my craft stick gingerbread house. 4. Stick on letter stickers to spell desired words. 5. Tie a bit of string and glue it onto the back of the stick. I used red embroidery thread. Let dry. RELATED: ABC Rings – another fun use of letter stickers! When your ornament is finished, have your child hang it on a prominent place on your tree. That way, they will see if often. 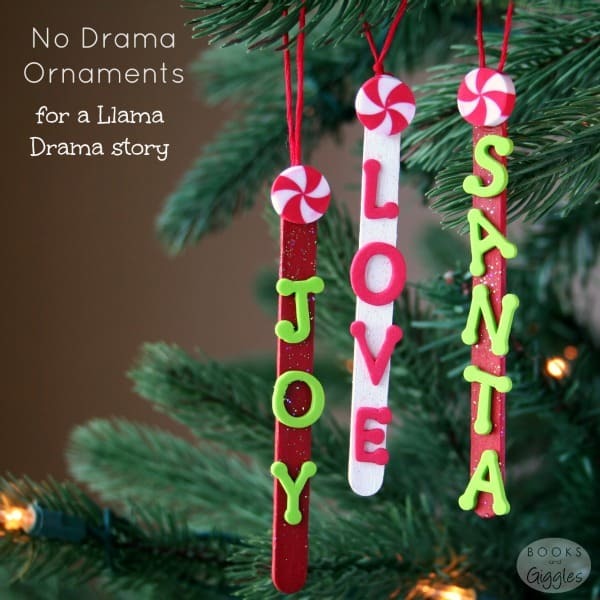 They’ll remember Llama Llama Holiday Drama and, while they wait for Christmas, they can think about the meaning of the season spelled out on their very own ornament. Double-Sided Elmo and Grover OrnamentsIf you’re still searching for the perfect Christmas ornament for kids to make this year, you can see all 70+ of them at Mama Miss. Such a cute idea! 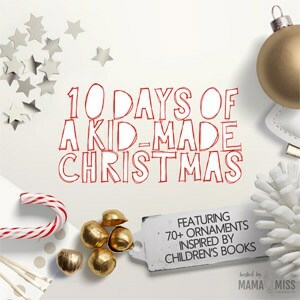 This was one of our favorite Christmas books last year too. I love all of the Llama Llama books. Thanks for these sweet ideas. My first graders loved these stories. This is something that the children will really like! Love the meaning behind the ornaments you chose for the book! This is a great ornament idea! We love anything to do with stickers. And we love Llama Llama!